Product and ordering information for BVC Fluid Aspiration Systems: Quiet & compact aspiration for modern cell culture & biology laboratories. 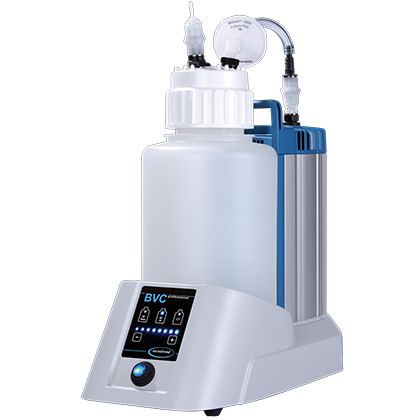 The BVC family of fluid aspiration systems are designed from the ground up to meet the needs of the modern cell culture laboratory. They are quiet and compact, and provide flexibility to accommodate your decontamination protocol. The BVC Basic is suitable for use with a central vacuum or VACUU*LAN® system. Complete with a mechanical regulator, it reduces demand on vacuum supply, increasing efficiency while reducing noise and impact on other applications. 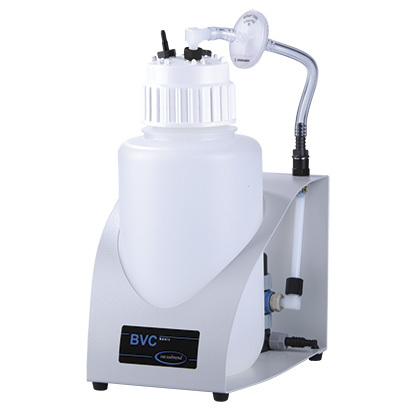 Both the BVC Control and BVC Professional feature a VACUUBRAND® chemistry-design vacuum pump. 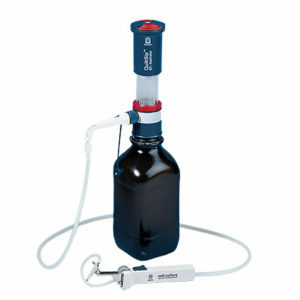 The BVC Professional adds a liquid level sensor outside the bottle. All models are available in heavy duty polypropylene or disinfectant-resistant "G" glass versions. 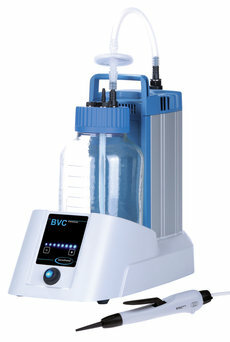 All BVC Fluid Aspiration Systems are supplied with: 0.2µm protection filter, VHCpro hand controller w/2m tubing, and a 4L polypropylene or 2L borosillicate glass (G) collection flask. Can the hand controller be autoclaved? Yes, it can be steam sterilized for 20 minutes at 121° C.
Can I get extra tubing for my hand controller? Yes. Spare tubing for the hand controller is catalog number 636156. The minimum order quantity is 2 meters. Can I get a multi-channel adapter for my hand controller? Yes. An 8-channel pipette tip adapter is available. It is catalog number 635679. What do I need to order to add a second hand controller? Well, a second hand controller of course - catalog number 688061. Then, a connector set - catalog number 699943 - unless you have the quick coupling on your bottle. The quick coupling connector set is catalog number 635807. Is it okay to put bleach in the 4L polypropylene bottle? It is not recommended to put bleach or other aggressive disinfectants in the polypropylene collection bottle. These can corrode the material of the polypropylene collection bottle, as well as other components (e.g., couplings), leading to stress cracks and breakage. If use of disinfectants in the collection bottle is desired, we recommend purchasing the BVC control G or BVC professional G with the 2L borosilicate glass bottle. VHCpro Vacuum Hand Controller - Second controller or replacement, supplied with 2.5 meters of tubing. 8-channel Pipette tip Adapter for VHCpro - For use with standard 96-well plates, designed with integrated tip ejector. Tip Adapter with ejector for VHCpro - Designed for 2-200µL pipette tips, includes tip ejector to remove the used pipette tip. Membrane filters - Hydrophobic 0.2µm aerosol filters, can be autoclaved up to 20 times. Spare or Replacement collection bottles - 2L glass and 4L polypropylene collection bottles, supplied with aspiration cap. BVC shuttle - Allows easy movement and access to the BVC under a safety cabinet.